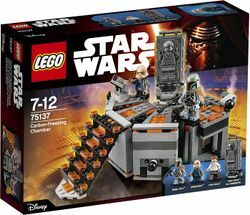 75137 Carbon-Freezing Chamber is a Star Wars set released in 2016. Help Han Solo escape his frozen prison! Han Solo has been taken to the Carbon-Freezing Chamber and is about to be frozen in a block of solid carbonite! Can he defeat Boba Fett and escape or will he be frozen for all eternity by the Ugnaught? Only you can decide. 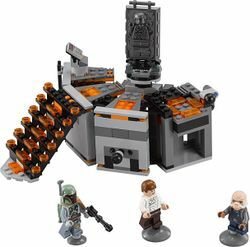 Includes 3 minifigures: Han Solo, Boba Fett and an Ugnaught. Features a control center, freeze bed with freeze function, staircase and an elevator. Lift Boba Fett into position with the elevator so he can keep guard. Pull the knob to engage the freeze function. Recreate unforgettable scenes from Star Wars: Episode V The Empire Strikes Back. Measures over 5” (13cm) high (with carbonite bed raised), 7” (18cm) wide and 5” (14cm) deep. Facts about "75137 Carbon-Freezing Chamber"
This page was last edited on 25 April 2016, at 01:06.